The Office for National Statistics reports that the Average Weekly Earnings for the Whole Economy including bonuses and allowing for seasonal adjustment is now £467. This is £1 more than the previous month and annualised is £24,284. Breaking this figure down between the Public Sector and the Private Sector reveals the Public Sector to be still coming out on top by some 3%. The Average Public Sector employee earns £479 per week compared to that of the Private Sector which funds those earnings (of course in conjunction with a lot of government borrowing) at £465. 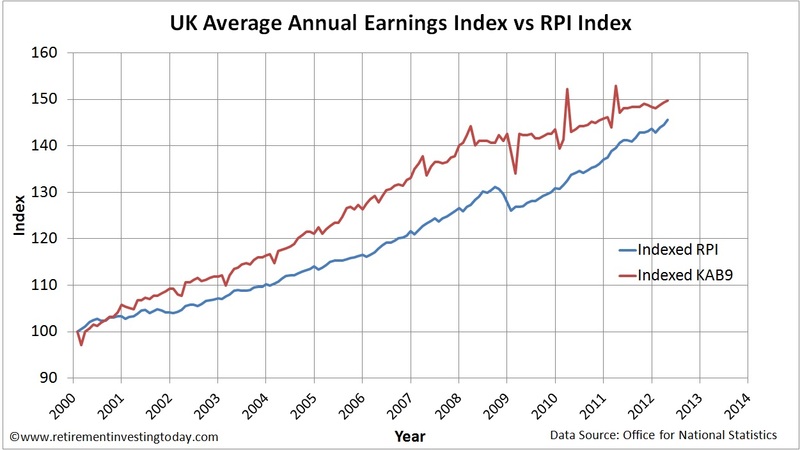 Unfortunately, while Average Joe’s Earnings were increasing by £1 in nominal terms the value of his Earnings was being eroded by inflation to the tune of £3.29 over the same period. This loss of purchasing power has been going on for quite some time now and is clearly demonstrated by my two charts today. My second chart then crashes both of these data sets together by correcting Earnings for the effects of inflation. 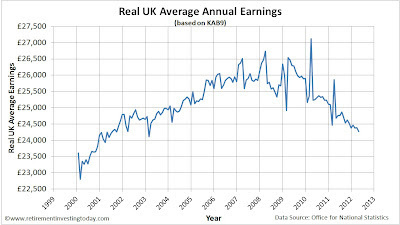 This shows that in Real terms Average Earnings are now back to that of March 2002. Personally, I could only wish for a nominal increase. I’ve just been through my annual salary “review” and as a reward for a whole pile of hard work was granted an increase of 0%. This is unfortunate as it means this year I won’t be able to increase the rate of money being saved into my Retirement Investing Today portfolio unless I cut back somewhere else. From where I sit today, already saving around 60% of my earnings, that could prove difficult. 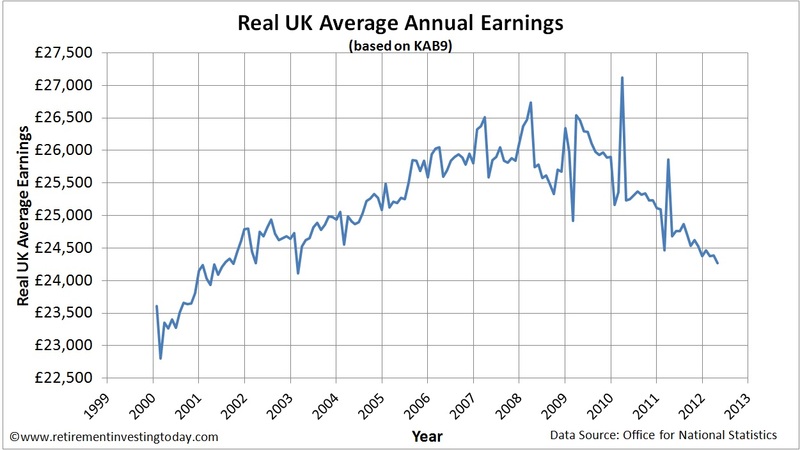 I recently used the BOE inflation calculator to compare my earnings in 2000 to my earnings today, I am about 20% up in real terms. Thats after 12 years of a combination of study, experience, hard work and training, and excellent yearly reviews with different managers. 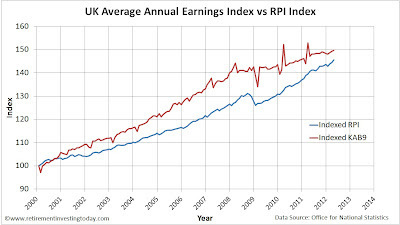 Not particularly impressive and I work for a FTSE100 company, but the bosses have had huge rises, 12% the other year ! I have done well out of various share schemes and I know I am in a far better situation than many, so overall maybe its not to bad. Thanks for sharing. I've stopped looking at what those above me have as I've come to the conclusion that they are no happier than I am. I am however thankful to be gainfully employed, even without a payrise, as I feel for those that are in genuine hardship below me. I can only imagine what they must be going through. I never wish redundancy, illness or misfortune on anybody. It is however just one other reason why I behave as I do. The sooner I get to financial independence the better, with or without pay rises.